Young people entering the world of work today face perhaps the most complex and fast-changing labor market in history. The gig economy, robotics, AI, 3D printing, autonomous vehicles… All these advancements mean young people will need to navigate their way through a lifetime of roles, continuously adapting and learning. Become Education is an Australian company creating imaginative and engaging tools to help young people prepare for 21st century careers. While careers have changed dramatically in recent years, careers counselling has not. Many schools rely on a one-size-fits-all approach, taking place late in the students’ school years, using static information. The vision behind Become Education was a process that put the student in the driving seat. Using an app, they would explore careers, and build plans that they could develop and adjust throughout their lives. A framework for their lifelong learning. David’s experience as a full-stack developer and information systems designer led him to graph technology – a genre of tech optimized for densely connected data. Web-based and tablet-friendly – the application had to be easy to access, from any device and any location. Web deployment and cross-device compatibility was a must. Engaging and interactive – developing awareness and then navigating tens of thousands of careers options could easily become overwhelming. The team were keen to avoid that using graph exploration techniques, including incremental loading, node collapsing and animation. Visually customizable – design and color is an important part of building engaging software, so the ability to style the application was crucial. Save and load – to support a workspace system that allowed students to create and maintain their own career plans. The KeyLines SDK allowed them to build a quality visualization tool quickly, get the application into schools faster and spend more time generating rich data. The application is being used by schools across Australia in the BECOME.ME Program, and they are now launching globally. The initial loading screen shows a number of industries as starting points for further exploration. This approach begins with a high-level overview before honing in on increasingly specific job roles. The student can then learn more about select specific jobs of interest, and save them to their log to review later. Combined with smooth animation, these techniques make it easy to navigate the 64,000 job roles and 1,300 categories. 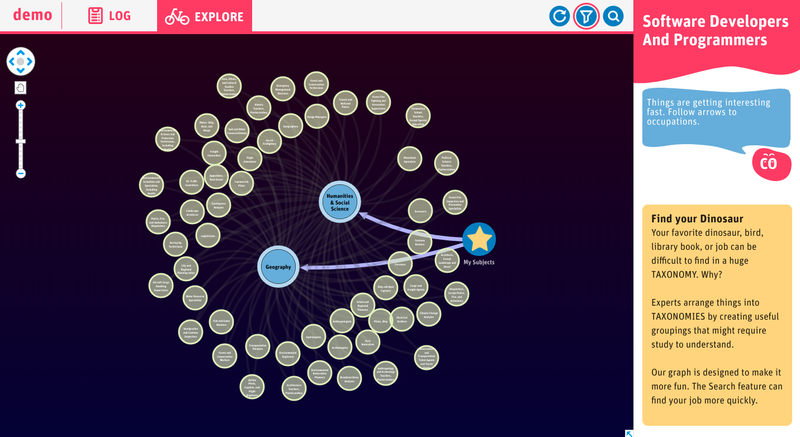 The neat graph layout helps to show clusters of related roles, without obscuring the picture with overlapping nodes. Also, using a square for the original node helps the student find their way around the graph. This clever use of filters removes a huge number of options, allowing the student to quickly find their way to the most relevant roles. Prior to usability testing I typically give parents an opportunity to explore the app unobserved. This helps them evaluate what I want the child to experience. One mom was certain that the application wouldn’t work. She took a couple of pages of notes explaining that our data was too big and the network presentation would be frustrating. The team at Become Education have big plans for the future. Future versions of the application will include enhanced filtering and exploration techniques, as well as a richer data model and more accurate and specific results. The goal for the application is to become a powerful, personalized careers advice platform and recommendation engine, powered by ArangoDB, KeyLines and machine learning. We’ll keep you updated!